Some posts contain affiliate links. By purchasing through the link, I receive a small commission at no extra cost to you. Sometimes, the smallest trigger floods the mind with memories. When I vacuum, I remember the mother of a college friend. She cleaned houses to earn extra money to support the family. However, she ENJOYED this task and took great pride in her work. My friend attempted to emulate her mother’s cleaning style on the occasions when she helped me (the few times I asked or she told me she was helping and didn’t let me argue). One of her mom’s signature traits was leaving no footprints behind when she vacuumed. My friend constantly apologized for not being THAT good when helping me. In all honesty, though I probably forgot to tell her properly, I was simply grateful for the help. This same friend helped me at least once defrosting a stubborn dorm-sized fridge. How funny we must’ve looked armed with blow dryers and spatulas attacking that old hand-me-down. We shared so many funny and silly times. Yet she was present one day when a piece of my heart broke – she would say it’s the first time she saw such emotion from me. I received word that a dear, wonderful old friend, Tom Jones (not the famous singer, but a song leader from a congregation we attended in Bedford, VA), had passed away. Yes, I cycle through most of these memories just by turning on the vacuum and watching the lines form on the floor. Her mother has since passed away as well, so when I think of her, I pray for my precious friend. Recipes instantly transport me to other places and times: maybe to my grandmother’s kitchen at Thanksgiving or observing my mother in the kitchen from an early age. While adapting some recipes is not possible (like my grandmother’s dressing – it can never be made “safe” for Dietrich), others have given me the opportunity to use the skills I learned watching these amazing homemakers. Though our household has allergy challenges to work around, I’ve never viewed this as a burden. Some recipes belonged to my Aunt Cathe, a wonderful cook and hostess. She loved her family to the end. The little reminders of her, whether it’s cooking her Enchilada Casserole, seeing a funny expression on my kids’ faces, hearing about someone putting bubbles in a fountain or setting off a whoopee cushion at just the right moment, can bring both a smile and a tear. Sometime recently, Facebook added an “on this day” feature. I easily get caught up in memories some days, looking through older pictures of the kids or remembering our travels and friends from previous places we called home. Each of my children have remarkable memory capabilities. Madilynn’s memories come out in very simple words and ideas. Once when I told her we were going to see Granddad and Gramsy, she said, “Granddad. Tea.” (She has many more words now, but the whole thought in this statement is that my dad lets Madilynn finish his watered down tea – sometimes she even gets a sip of the good stuff). On our most recent trip, she remembered that Grandmama has a Thomas the Train phone in the toy cabinet. Dietrich sometimes goes for weeks or months without mentioning people or places, but when he does, he talks as if we are still there. 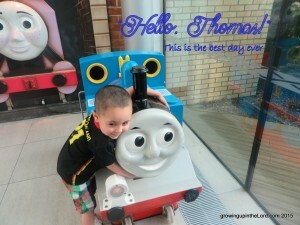 His favorite memory is still Thomas Land – The Best Day Ever. Other days, I struggle to remember anything, possibly my name. I even almost inverted Madilynn’s date of birth with the pharmacy – which would have created a birthday that hasn’t happened yet. Peter’s new job experiences sometimes remind me of past cases. All the children in the world in need of better parents… so many parents discarding babies without a thought… so many people who would open their homes to each of those children, if only the red tape and bureaucracy weren’t in the way. While we remember the past, we ought to learn from it and not dwell there. We can honor the past without remaining stuck. Moving forward from some memories takes courage, from others it’s simply one piece of the puzzle of our lives. 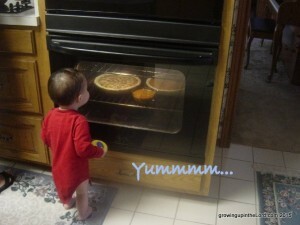 This post is part of the One Word Blog Linkup hosted by, Janine and Lisa! This week, the word prompt choices are MEMORY and ANGRY. If you would like to join the linkup you can find more information HERE, sign up for weekly emails HERE, and/or join our Facebook group HERE. Every Friday, two prompts are emailed. Choose one and write a post using that word as inspiration. Linkup up any time between 6:00am EST on Wednesday-9:00pm EST on Thursdays on any of the host sites. Aw, I am so similar to this and remember so much from my past and then there are days and moments where I can barely recall what I did yesterday, but still the past has a way of coming back to me, as well. Maybe we can blame it on Mommy Brain?